How did we frame our tiny house? With a little help from our friends... at Tumbleweed. We drove to Colorado Springs in May 2014 in our new truck bought specifically to tow our new Tumbleweed Amish Barn Raiser 24' Cypress model and brought it home to Texas to complete the building process. Barn Raisers are models that provide the framing, sheathing, and securing by tiny house building professionals yet gives us the opportunity to customize everything else - all important things considering our very hectic work and school schedules, as well as the need to accommodate a growing toddler in the space. The planned result? 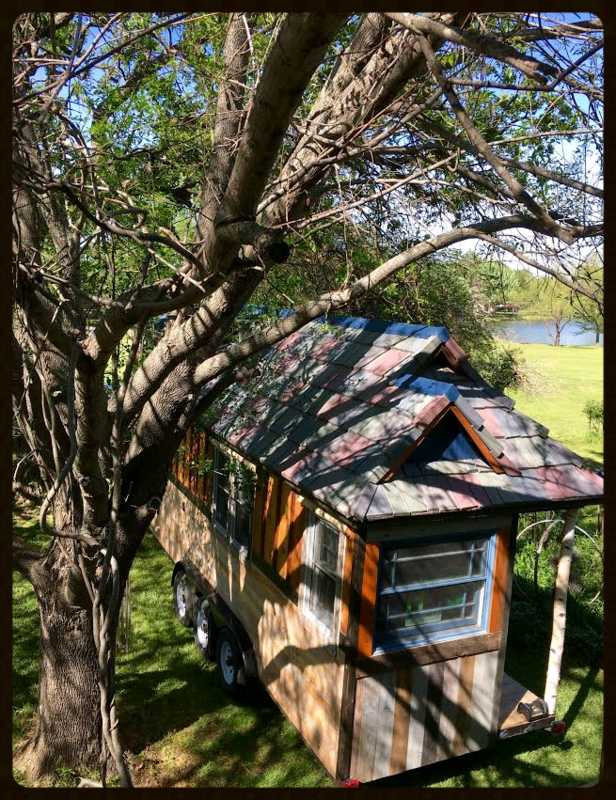 Our very own mobile, custom tiny home built to withstand heavy road travel and the many different climates across the country as we visit family and friends, explore the natural wonders of our continent, and see our favorite places through the eyes of our child. In October 2015, we relocated to Northern Colorado after finishing up the bulk of the interior based on the professionally designed mechanical, electrical, and plumbing (MEP) plans we commissioned from Gary at Tiny House Systems, re-titling the trailer as a Park Model Travel Trailer to get proper Travel Trailer license plates, and making the 800+ mile trip to our winter parking place. Our house has a very minimal electrical load that utilizes a combination of 12V DC LED and 120V AC LED lighting, and we're saving up for a solar system now. With a propane water heater, composting toilet, wood stove for heat (plus electric backup), on-board 40 gallon fresh water tank, plans for an alcohol cook stove (using induction for the reduce moisture output this winter), and gray water waste only, we're all set to be almost exclusively off-grid once we settle on a portable solar power setup. We chose to spend our first winter in our tiny house in an RV park accustomed to dealing with real winter weather so we wouldn't have to worry about winterizing anything more than the house itself. Training wheels, my friends! Here are R.A.D. and Meg posing at the the open house we had at Trailer Made Trailers in Denver on our way to our winter parking spot in October 2015. Photo credit to Guillaume Dutilh of Tiny House Giant Journey - he's amazing! The house did quite well despite 2F temps and several feet of snow off and on throughout the winter. We had 2" thick closed-cell spray foam insulation installed by a local Texas company, and we also added a 1/2" of exterior foam insulation to help keep us extra toasty in the cold Colorado climate. The Kimberly gasifier wood stove we bought, which doubles as an extra cooking surface and will eventually be our oven and even a source of light and electrical charging power thanks to some really clever compatible after-market accessories, is rated for 1500sqft of heating and kept us nice and warm on the days we used it. The built-in freeze protection of the Precision Temp RV-550NSP water heater, as well as the rigid foam insulation we've added to its compartment, kept our showers warm and soothing, though water pressure issues at the park were the main reason we chose to take advantage of the bath houses most of the time. We used a heated water hose and only had a few incidences of frozen water early in the mornings, but we were glad we decided to move the PEX water pipes to inside the building envelope (with clever disguises of course) to reduce their likelihood of freezing. Even though the rest of our travels will be against the seasons (i.e. the South in the winter, the North in the summer and fall), we're glad we were able to test our tiny house in a trial by... snow?!... on its maiden journey. We did find some trouble spots where mold started to form, so we're taking steps to rectify those issues and prevent further troubles in the future. That's why we're so glad we had this wintry test run - now we know the trouble spots and can fix them with ease before we hit the road! We were hoping to have the house at least 90% complete and ready to travel to the very first Tiny House Jamboree in Colorado Springs in August 2015, but the frequent weather delays and limitations on funding left us scrambling a bit to complete the house in time for the move to Colorado in early October. We still have a good bit of finish work left to do, but thankfully the rest is mostly trim and paint that we can chip away at it a bit at a time. A multitude of circumstances changed for our whole family in early February 2016, so we made the tough but ultimately best decision to return to Texas for a while where we will have the ability to really, truly finish the tiny house and make the necessary changes to the design we've agreed on after our trial run. Colorado was never going to be our permanent home, and interestingly the very first plan only called for us to be there for six months anyway. The downside is that we won't be living in the tiny house full-time for many months, but we do have a safe place to park it and finish the build back at Meg's dad's place. We know in the long run this intermission of sorts will actually set us up for the best situation to make our Washington state dreams come true, and we are so grateful to have the chance to finish the house without the added stress of trying to live in it at the same time. Small blessings! Here's the house back in Texas, albeit in a slightly different location at Meg's dad's house. We'll be parked here while we finish up the remaining detail work, improve on some areas we discovered need help, and prepare the house for the long haul around the country and finally to Washington! We will continue to regularly post about the progress and improvements on the house, and we invite you to continue reading our blogs and viewing the galleries as we add more photos a bit at a time. The best way to see our day-to-day posts is either on Facebook or Instagram, so follow along with us as TinyHouse43 on both platforms. Meg at the very least will be attending the 2nd Annual Tiny House Jamboree again this fall in Colorado Springs, so be sure to look for her or us all there in the shirt pictured below! Did you spot us at the First Annual Tiny House Jamboree?? We'll be there for 2016 as well, so come say hello! Shopping with our links keeps our truck a'rollin! Every little bit helps, so thanks!